Even though I tout Rasa Malaysia as the online source for Asian cooking and recipes these days, I don’t have any Filipino recipes! When I started thinking about having Filipino guest writers, I immediately thought of ChichaJo of 80 Breakfasts. I adore her beautiful blog, writing style and fab food photography. So, please welcome 80 Breakfasts to Rasa Malaysia as ChichaJo shares with us the recipe, origins, and various adaptations of Filipino adobo. Drool! Although I love my local cuisine just as much as the next Filipino (which is to say a lot! ), I am an absolute beginner when it comes to cooking Filipino food. That’s why, when Rasa Malaysia asked me to guest-write a post on a Filipino dish I was a bundle of nervousness, despite being over-the-moon flattered! I am just at the beginning of my journey through Filipino cooking and I am still fumbling through some of the twists and turns. Even so, I was very excited and I knew what I wanted to write about – adobo! Aside from it being one of those dishes that are immediately related to the Philippines, I am currently in the thick of adobo experimentation. You see, I never cooked this dish when I was younger (it was always prepared by someone else) so it is only now that I am flush with infatuation at adobo’s many faces. There are as many adobo recipes as there are Filipinos. Maybe more. I certainly have more than one. Just taking into account recipes which would fall under categories like “the original”, “traditional”, or “best-ever” would fill up volumes and volumes of books…each varying from the next. That isn’t even considering all the reinventions, fusions, and new versions that this simple dish is going through! And adobo’s origins? Another minefield of confusion! Spanish? Mexican? Indigenous? With soy sauce? Without? Soy sauce came to us by way of the Chinese, so any adobo made before that would only have had salt. Does that mean any adobo touted as “traditional” or “original” shouldn’t have soy sauce? Logical to some, a sacrilege to others! Knowing this, when it comes to adobo, I proceed with both caution and abandon. I can loosely say though, that Filipino adobo is a stew or a simmer of meat or vegetables cooked with vinegar. The most common versions uses chicken or pork or both, with soy sauce to flavour, as well as bay leaf, black pepper, and garlic. The pillars of adobo. That being said, we also have versions using squid (adobong pusit), long beans (adobong sitaw), and water spinach (adobong kang kong). I have seen people use everything from baby back ribs to catfish in adobo. Some like to cook their adobo without the soy, using salt instead, or even patis (fish sauce). Some like to add coconut cream towards the end of cooking (my late grandfather’s favourite). There are Spanish-influenced adobos that use red wine and smoked paprika. There are also Chinese versions that use star anise and oyster sauce. Others like to add liver spread or liver pate to thicken the sauce. Different regions of the Philippines argue as to what is the best vinegar to use for adobo and there are heated debates about when you can stir the sauce (never stir until the vinegar has burned off most of its acids!). I don’t think there is, or will ever be, a truly definitive recipe for Filipino adobo. Despite some lovely Filipino cookbooks finally making themselves seen locally and beyond, Filipino cooking in general is still so personal, so familial – recipes are stories and myth and fables, shared over the kitchen table, handed over to friends and family like gifts. I can’t help but love this dish all the more for its refusal to be pinned down, along with its questionable and uncertain past. For me, adobo eludes as much as it entices…and that is what always has me coming back for more. So instead of sharing The Recipe For Filipino Adobo, I am sharing with you My Recipe For Filipino Adobo. This isn’t my only recipe, much as it isn’t my only “adobo story”. This is my basic “springboard” recipe from which more adobo adventures start. As with men and chocolate, I like my adobo dark, which is why I use soy sauce. I also like to mix pork and chicken, despite arguments to the contrary. I may make adobo using only pork, but I will hardly ever make it using only chicken. The pork makes the whole dish, especially the sauce, more robust so I consider having to fish out of the chicken mid-way a step well worth it. I urge you to use pork belly that has still got the bones attached and skin on – then make your butcher cut it into nice chunks (I like biggish pork chunks in my adobo). The bones and skin will work wonders towards giving your sauce more body. Frying the chicken and pork after they’ve been cooked is a messy affair – I confess, sometimes I skip it – but it really does make a difference and the caramelized bits of fatty pork and chicken skin will make cleaning an oil spattered kitchen seem like a small price to pay. One of the oldest adobo adages is not to stir the sauce until the vinegar burns off most of its “acid”. Another bit of advice I’ve heard is to always leave the garlic skin on. I can’t say I totally understand either, but I do like the feeling that I’m following some age-old, almost mystical, piece of wisdom – so I go ahead and do it anyway! – Pop one star anise into the pot to give it a brilliant fragrance and a Chinese flavour. – Add a peeled hardboiled egg towards the end of cooking…my husband loves this! – Add one peeled sweet potato to add a touch of sweetness. – Experiment with different types of vinegars! I also make a version that uses red wine vinegar – and instead of chicken and pork I use lamb shanks and I add in some peeled pear quarters. – Add a handful of peeled pearl/spring onions to the mix – they will get all melty as the adobo cooks and enrich the sauce. – Slow cook your adobo in the oven while you do chores around the house. – Use leftover adobo (flake the meat) for awesome fried rice! - Put all the ingredients except for the water in a Dutch oven or any heavy duty pot and leave for about 30 minutes to marinate. - Place the pot over medium heat, add 1/2 cup water, and bring to a boil. Lower the heat to a simmer and simmer without stirring until most of the vinegar’s acid has been cooked off – you will know when this is done because it won’t smell as sharp and “sting-y”. - Keep simmering over low heat until the chicken is very tender - about 40 minutes to an hour. Taste the sauce. If it’s too salty or too sharp for your taste, add some of the remaining water. I usually end up using 3/4 cup total. - When chicken is tender, remove the pieces from the pot and set aside. At this point the garlic will be very tender as well – you can mash some (not all!) of the cloves against the sides of the pot to incorporate it into the sauce. - Keep simmering on low heat a further 30 minutes to 1 hour or until pork is meltingly tender. - When pork is very tender, remove from pot and set aside. - Keep simmering sauce until reduced to your desired consistency. Taste the sauce and if you’d like a bit of sweetness, stir in a pinch of brown sugar – I like to do this but you certainly don’t have to. - Heat a skillet with some oil over high heat. When the oil is hot, fry the chicken and pork pieces to brown. - When the sauce has reduced to your desired consistency add the browned chicken and pork back to the pot. Toss gently and remove from heat. - You can eat it at this point but it gains depth of flavour if you let it rest for a day. 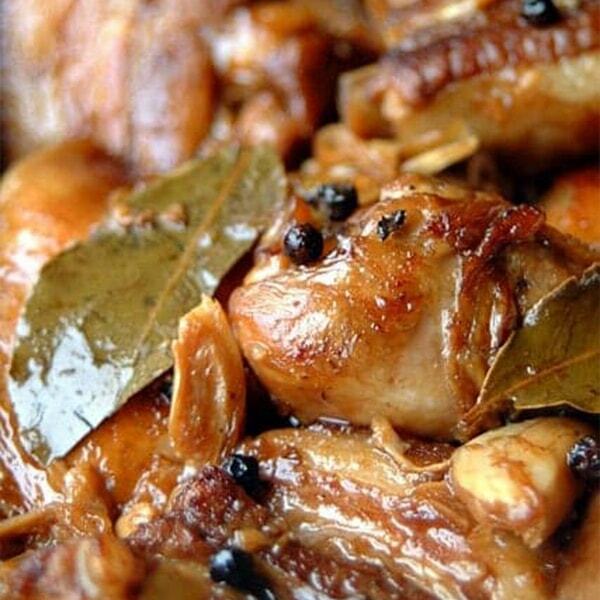 I just love adobo and your pics are making me dying for it………. May I use some of your pics on my site when I start the food section? Growing up in Qatar we knew many Filipino families and one of the things I quickly fell in love with was this adobo chicken. I have never really made it myself at home because I simply did not trust the recipes I found. But Joey – this is great and I will certainly be making this one! Thanks! 2 common meats but an its uncommon match! But if creativity is to reign let’s break the rules. Even oral tradition about vinegar and garlic. To keep or to experiment. Philippines are so rich with her many influences. I find them adventurous and warm, like this recipe. Please surface more of these familial secrets! Can’t think anyone better to represent home-cooked Pinoy food than you. I’ve been experimenting with adobo recipes, too, especially for the slow cooker. I’m not a pork person, so I won’t be trying this one, but the photos look lovely and just like the adobo of my dreams. I made this once years ago and loved it. I think I will make some tonight. Love your creative tips about the star anise and such. Great picture. Yeeeah! Filipi-no! Filipi-no! (Uh, I’m singing “Bebot” by the Black Eyed Peas). Anyway, there’s good reason this is our national dish– all that garlic and black pepper gives it a lovely, deep flavor. I want this with a heap of rice now! Frying leftover rice in the oil/sauce from adobo is also a great treat! We love adobo in our house. thank you for the excellent writeup and beautiful picture! I am especially intrigued that some people use liver pate to thicken the sauce. What a delicious adaptation! We normally use apple cider vinegar, although I think this is just to make it easier for those who can’t find Filipino vinegars locally. Living in the Bay Area, we have lots of Asian groceries with Filipino food aisles – should pick up some different vinegars to try out. We’ve just posted a recipe for tau yu bak – pork braised in soy sauce that is at its core like adobo without the vinegar. I think I like adobo better, though, because of the vinegar. Nice writeup! I love dishes that have no set recipe since it leaves a lot of room for the imagination. You’re adobo recipe is pretty similar to mine, but I really like that you added pork belly along with the chicken (I’ve always done one or the other). This is the best looking adobo I have ever seen! Can’t wait to try this…the caramelization is amazing and adds such appeal to the dish. I’ve heard the same thing about garlic skin… I do notice that the garlic has a sweeter flavor if you leave the skin on. Wow! So nice to read so many positive comments on Adobo! :) Thanks everyone!!! Any idea where to get white cane vinegar in KL? I want to try this recipe but dont know where to get this vinegar. I have my own adobo recipe but I’m always on a look-out for better recipes, not just for adobo. I’m looking forward to trying this. Thanks for sharing, great site. I recently visited your blog http://www.rasamalaysia.com and I want to place some advert pages on your site for a full year. Regarding the client I will place links for my client related to food and health. For now please let me know how much you expect for this ad if it is possible. Awaiting for your awesome reply. Thank you for finally including a filipino dish in your site. sometimes i feel filipinos are the forgotten asians..hehee… adobo is soo good.. in fact, this recipe made me want to do it for dinner this week! This sounds so fantastic, and I love the photograph. Great write-up, Joey! I’ll definitely try combining chicken and pork the next chance I get. And thanks, Bee, for including a filipino recipe on your site! now a true blue asian site for asian recipes..philipino included..
One thing my wife and I add to our adobo is chunks of chayote squash. The crunchy texture and slightly sour taste improve the stew immensely. I throw two chayote, cut into 1 inch chunks, every time I make it. The chayote is firm enough that it can be added at the same time as the meat. The first time I tried making Filipino Adobo turned out to be an EPIC FAIL, it turned really dark, and even my dog wouldn’t dare and eat it. I tried your recipe, and the Lord be praised, it was sooo good! My Mom even said I can go ahead and get married “pwede ka nang mag-asawa”, but then I said to her…Mooom, I’ve been married for 3 years now! “My goodness” she said, “What have you been feeding him?” Thanks so much for this recipe! I’m now officially allowed inside the kitchen! I have to agree that is one awesome delicious-looking adobo! If I want to brown the meats in the oven – on what temperature and how long?? My husband claims he remembers Filipinos in the Manilla or Tarlac areas using a sweet soda (like Sprite) in their Adobo…have you heard of this variation? Sprite is used as a substitute for water. It may do a little twist just like what it does with BBQ sauce and fresh seafoods! Maybe he’s thinking of 7up BBQ chicken? It’s typically served as a BBQ kabob. I love adobo! Thanks for that star anise tip. I’ve always been curious about what “adobo” actually was. I would hear different things from a lot of people. So it’s good to hear that its definition is a bit hazy.This sounds like some good comfort food. Good work 80 Breakfasts! I made this for my Filipino wife. Chicken Adobe is her favorite dish of all time. She loved it! As good as her yaya’s if not better. Im not allowed to tell her that though! I made this adobo recipe tonight and it was so good! I’ve tried making adobo in the past using various recipes which turned out to all be too strong and sour, but this recipe had the perfect flavor when using 3/4 cup of water as you recommended. It was also yummy with the pork belly. Thanks! This recipes replaces all my other adobo recipes. Hi Linda! So happy to hear you liked the recipe! I also went through a lot of tweaking before getting to this recipe :) In the beginning I was hesitant to add water even though many suggested it…now I know why! Adobo is one of the first dishes I learned to cook but I was always taught to brown the meat first. Whats the difference? I am also Pinoy & I love Adobo! I never really learned to cook adobo when I was still in Manila, but since I left & lived in Germany, I just had to learn it as it is one of my favourite dishes. I have also tried many version of it. I just wanted to add that I have tried doing my Adobo with BALSAMICO Vinegar. I once wanted to cook Adobo & i ran out of normal vinegar, so I got hold of Balsamic vinegar & it tasted quite good , too! Just don´t put too much as the vinegar is strong & dark. Thanks for letting me share this info. Love the blog…and the recipe for adobe. Growing up with my Dad, his wife would make the occassional adobe and I sometimes hunger for it. I might try this recipe tonight!!! Great piece on adobo! I first came to the Philippines (being Fil-Am) a couple years ago and have been amazed at how many different versions of adobo people here cook. And the vehemence at which way is the “correct way”! I LOVE your addition of pork belly. I read this and smacked myself on the head wondering why I had never used pork belly, my favorite part of the pig! Thanks for this recipe!! I was without my standby recipe (from an old newspaper clipping) and this was a very close substitute. The only thing I did differently was doubled the liquids (for more sauce) and threw in a can of quail eggs at the end. i love adobos similar to humba but the garlicky taste seems so nice esp..adobo cooked in sprite as water oh so yummy…theres a lot of adobo version it depends who cooked it…i love your recipe too ill try this one…put more recipees please..
Gotta try that wih the Sprite next time! Hi! You have a very good website here. Can I use your adobo picture? I am making a free ebook and I need some quality pictures. Thanks. Sorry, no, you can’t use the photo unless you pay a license fee. Plus the photo belongs to the guest blogger. Great photos! This recipe has maybe too much vinegar for my taste. I like a 1:1 ratio for vinegar and soy sauce. I have lots of different kinds of adobo recipes there. I will be cooking dinner for 25 children (ages 7-11) from the Phillipines, Nepal, and Uganda. I would like to cook this recipe for Phillipino children, but I am not sure how much to increase the ingredients for the recipe “My Filipino Adobo” Would I be correct in saying the recipe listed would feed 4 people? Of the 25, 8 are from the Phillipines & 8 from Nepal… but who knows, they may all like this recipe!! Any help would be appreciated! Also easy suggestions for a Ugandan recipe that children would enjoy would be great! So this is my second time making this recipe, and although it tasted great the first time I seem to remember having to add quite a bit more water, even though I was only using the 800g or so of chicken. This time I’m adding pork, and I think the chicken pieces are bigger than last time, and the 1/2 cup of water is nowhere close to covering the top of the chicken pieces in the pot. Do I need to add more water? It looks like another 1 cup at least is needed to ensure the chicken is covered. Or will the chicken be steamed sufficiently by the sauce under it? how do you print the recipe without all the rest of the stuff? I remember the smell of Adobo coming from my friend’s mother’s kitchen in high school. This recipe was that same intoxicating aroma. Simple is always best. I tried this dish yesterday, with thanks. The only problem was, I used dark soy sauce instead, and it turned out just as good, as I added a bit more water. Especially like the caramelized meat pieces. I served it with green vege and mango chutney. Family loved it.Next time I will use the normal soy sauce. Thanks again. This is exactly how we cook adobo at home (Philippines) but I don’t get the same mouth-watering aroma when using the garlic here in the US. We should try this later for dinner.. I really like adobo. Mmmmmm….adobo. If you really want to experiment with adobo, try it with lemongrass, ginger and coconut milk. A while back I read in Simone Beck’s book, Simca’s Cuisine (1972), that the garlic peel has as much flavor and aroma of the garlic as the garlic itself. So in dishes needing a strong garlic aroma (like Adobo), I just smash garlic and throw the whole thing including the peel. Never failed! My Filipino maid used to cook Chicken Adobo, one day I taught her to cook stew. I told her that Chinese cuisine’s secret was to fry all the ingredients well before adding in water. The next time when she cooked the Chicken Adobo, it was so, so yummy even herself was shocked. I asked her why this time it tasted so good. She told me that she applied my teaching into her cooking. Since then she cooked well. So try to cook it the Chinese way, stir fry until dry and then add in the water to simmer. Glad to see the coconut milk mentioned. I made the America’s Test Kitchen version and it’s amazing but friends tell me it’s not REAL adobo because of the coconut. Their loss since it’s SO TASTY!